69% of Democrats support the Green New Deal, while 29% support the Green Real Deal. 47% of Republicans back the Green Real Deal and 25% support the Green New Deal. 77% of voters back a congressional commitment to clean energy innovation for all energy sources. 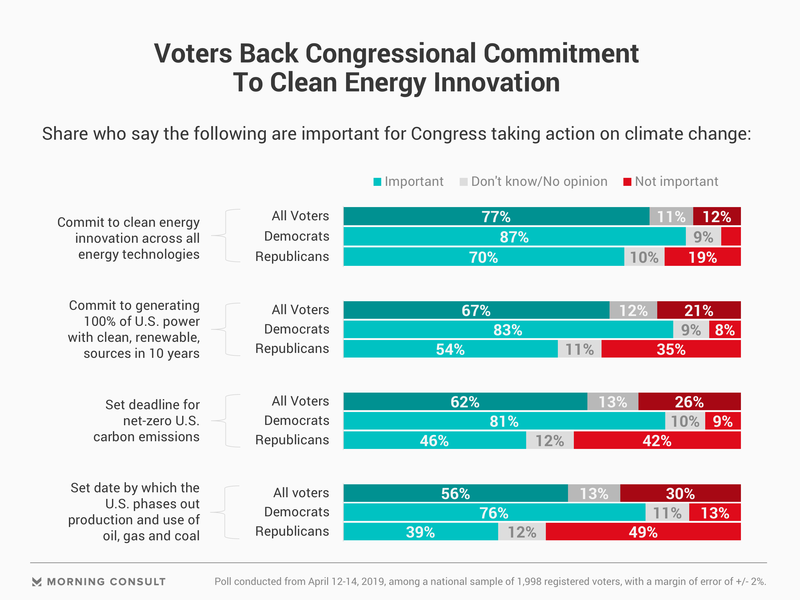 When it comes to addressing climate change, majorities of U.S. voters consider it important for Congress to commit to clean energy innovation and 100 percent clean power generation over 10 years, according to new polling from Morning Consult/Politico. And while Democrats and Republicans were more likely to support their own party’s proposals over those offered by the opposition, voters rallied in greater numbers around some of the individual policies put forward in the resolutions. For instance, 77 percent of all voters considered it very or somewhat important that Congress commit to clean energy innovation across all energy technologies when acting on climate change — a policy proposed in Florida GOP Rep. Matt Gaetz’s Green Real Deal resolution, introduced April 3, which backs federal investment in carbon capture technologies and low- and zero-emission resources but does not set specific goals or timelines for clean energy generation. And roughly two-thirds (67 percent) said it was important for Congress to commit to generating 100 percent of U.S. power needs with clean, renewable and zero-emission energy sources over 10 years, as Rep. Alexandria Ocasio-Cortez (D-N.Y.) and Sen. Edward Markey (D-Mass.) advocated in the Green New Deal resolution. Their plan in part calls for eliminating greenhouse gas emissions as much as possible, meeting 100 percent of U.S. power needs with clean energy over 10 years and guaranteeing living-wage jobs. The April 12-14 poll surveyed a 1,998 registered voters, with a margin of error of 2 percentage points. Meanwhile, proposals to set deadlines for certain climate actions were met by tempered but still majority support. Sixty-two percent backed Congress theoretically establishing a deadline by which the United States must try to reach net-zero carbon emissions, and 56 percent said they supported naming a date by which the country would phase out production and use of oil, gas and coal. “The mandate of a timeline can feel good, but it may not be achievable, and then you have adverse consequences,” said Heather Reams, executive director of the Citizens for Responsible Energy Solutions, a conservative clean energy advocacy group that she said gave Gaetz “a laundry list of ideas” for the Green Real Deal. Support was weakest among Republicans for all four policies listed in the national online poll, reflecting a broader lack of interest among the base on the issue: Just 15 percent of those voters said passing a bill to address climate change should be a top priority for Congress. Lawmakers have created little room for civil discussion over the resolutions themselves. Senate Majority Leader Mitch McConnell (R-Ky.) derided the Green New Deal as a “socialist” fantasy ahead of a March 6 chamber vote on the provisions of the proposal. Meanwhile, Ocasio-Cortez told Newsweek that a draft version of Gaetz’s proposal was “lame” and lacked courage. The Green New Deal is more popular with voters than the Green Real Deal by 10 points, with 46 percent in support of the former and 36 percent in support of the latter. 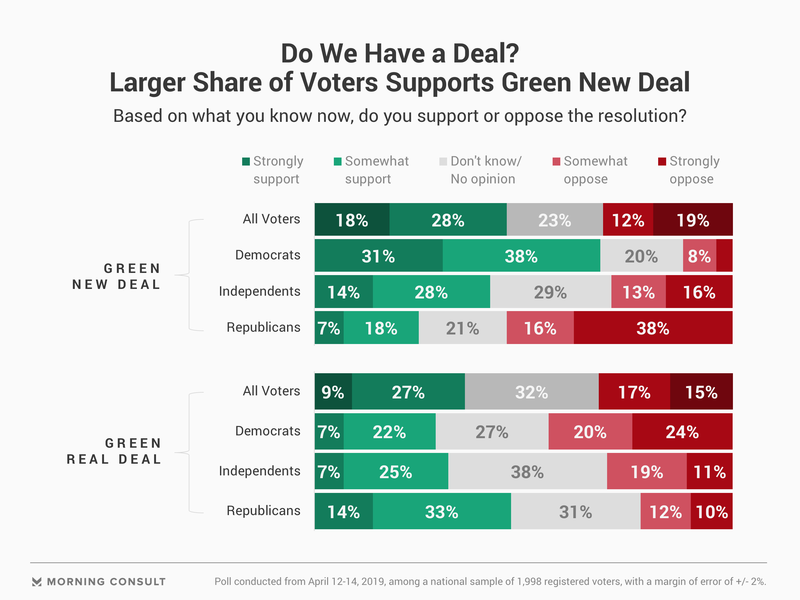 While 69 percent of Democrats said they strongly or somewhat support their party’s Green New Deal, 29 percent said they support Republicans’ Green Real Deal. Likewise, 47 percent of Republicans back the Green Real Deal and 25 percent support the Green New Deal. Hurlbut said he is encouraged by the 39 percent of Republicans who called it very or somewhat important for Congress to set a date by which the country would phase out production and use of fossil fuels. “That is something that we can work with,” he said. Climate change is seen as one of the graver threats facing the country, according to Morning Consult/Politico polling. A March 22-24 poll found that out of 12 options, only illegal immigration and terrorism were seen as greater threats to the United States by all voters. Despite public support for some of the policies in the climate resolutions, faith in Congress to act on climate change is mostly down or unchanged from a year ago, according to the poll. Thirty-six percent of voters said they have less confidence in Congress to take action on the matter than a year prior, while 37 percent have the same amount. Fourteen percent of voters said they have greater confidence now.